In recent months, a number of incidents have taken tensions between Armenia and Azerbaijan to very high levels. On the Azeri side, the rhetoric is more and more explicitly anti-Armenian and warlike, as clearly exemplified by the Safarov case and the story of writer Akram Aylisli. Yet, things have not always been such. We adhere the peaceful settlement of the conflict. I think that we will find the way of settlement of the conflict and it will be in conformity with interests of both Armenia and Azerbaijan. I don`t think that Armenia and Azerbaijan will always be in conflict situation. I don`t think so. Because the history proves that it is not possible. […] However, not only Azerbaijan suffered losses, Armenia had losses as well, there are handicapped people in Armenia too. Therefore, it is necessary to establish the atmosphere of trust in order to go towards peace and settle the conflict peacefully. Heydar Aliyev continued by stating that the journalists of the two countries could have a particularly important role in this process, and saluted the encounter that had taken place on that occasion. I quote now an excerpt from a recent speech by President Ilham Aliyev , son of Heydar, on the occasion of the twentieth anniversary of the founding of the Azeri ruling party, the New Azerbaijan Party (extended passages of the speech were posted in a series of tweets on the Azeri president's Twitter channel). The main focus of our foreign policy is the resolution of the Armenian-Azerbaijani Nagorno-Karabakh conflict. We will continue our efforts. I want to reiterate that our position is very firm, it is based on international law, history, justice and on our growing strength. We are conducting talks and at the same time building up our military strength. The gap between Armenia and Azerbaijan is already very large and keeps expanding day by day. Azerbaijan grows stronger and more powerful by the year, while Armenia weakens and declines every year. Evidence of this is the mass exodus of people from Armenia to other countries. We will continue our efforts to isolate Armenia. This policy is working. We see its results. We will continue to expose Armenia’s aggressive policy in all international organizations. The number of our friends in the world is growing. A growing number of countries want to cooperate with us. We have started to invest in various areas in foreign countries. This is a new process. We will step it up. Thus, our political and economic relations with all countries of the world will become even stronger in the future. Three countries have already officially recognized the Khojaly genocide as an act of genocide. This process has already begun and will be continued. We must ensure that as many countries as possible recognize Khojaly as an act of genocide. So from a medium- and long-term perspective, the restoration of Azerbaijan’s territorial integrity is beyond doubt. Neither we nor the mediators involved in the matter have any doubts about that. That is why we believe that international mediators have been more active in addressing the issue lately. Everyone knows that the growing political, economic and military power of Azerbaijan will lead to a complete resolution of the issue in favor of Azerbaijan. Our main enemy is the Armenian lobby. I have often talked about it, I want to say it again without fearing anyone – our enemy is the Armenian lobby. Because Armenia as a country is of no value. It is actually a colony, an outpost run from abroad, a territory artificially created on ancient Azerbaijani lands. Aliyev does not hide the fact that Azerbaijan is strengthening its military power and trying to isolate Armenia, which he calls "a country of no value", suggesting also that the territory of contemporary Armenia is historically Azeri – a theme that Aliyev has brought up also in a speech a few days ago : "the Armenian state was established on lands that are historically Azeri. The Khanate of Yerevan, Zangezur, and Geycha [Sevan] – these lands are all historically ours". No sign of the need for a reconciliation process, of an agreement that satisfies both countries, of the inevitability of peace and friendship between two neighbouring peoples that characterized the speech of Aliyev father in 1999. I quoted two excerpts from public speeches by Ilham and Heydar Aliyev, separated by over 10 years. These are individual speeches in different contexts that, as meaningful as they may be, certainly cannot reflect the complexity of the Aliyevs' approach towards the Armenian-Azeri conflict under their presidencies. They do, however, signal that something has changed. 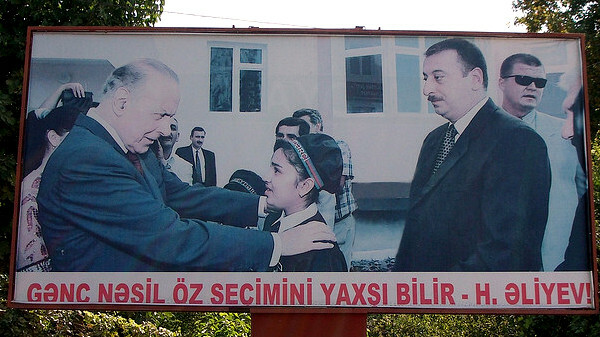 The rhetoric of Aliyev father seems remarkably conciliatory and pacific compared to his son's. Between father and son, with regard to the approach to the issue of Nagorno Karabakh, something really has changed.